The first thing to note is that Swiss rolls are deceptive; they have nothing to do with Switzerland. And though I’m usually deeply offended by misnomers, the Swiss roll more than makes up for it aesthetically and in terms of flavour. Moist but deceptively light – on account of a lack of butter – you’ll find yourself unable to stop rolling once you’ve realised just how simple this cake is to make. 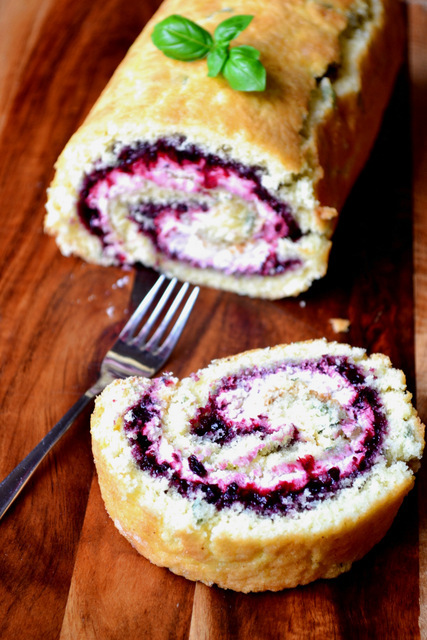 My recipe for Blackberry and Basil Swiss Roll is no exception. After watching the opening rounds of this year’s Great British Bake Off, I was convinced that attempting a Swiss roll was something to be feared. It is not. This was my first attempt and, as you can see, it wasn’t half bad! Success is in the process; so, how do you roll a Swiss roll? Firstly, brush the tin and greaseproof paper with oil, before sprinkling with sugar. Absolutely no part of the sponge should stick; it’s extremely delicate. Secondly, when cooked transfer it to a second layer of sugared greaseproof. Thirdly, gently score the rolling end of your Swiss roll before you attempt to shape it. Finally, pre-roll your cake along with the greaseproof and leave in place until absolutely cold. Follow this guidance and you should end up with a perfectly shaped, fully intact Swiss roll with an even layer of filling. This is a recipe that’s easy to make your own. The blackberry and basil combination is delicious and well worth a try, but any jam will do nicely. Try popping along to your local food or farmers market; you’ll usually find a wide array of interestingly flavoured preserves, which would be perfect for a treat like this. Fold the flour, salt and basil gently into the eggs until fully incorporated. Transfer the fluffy batter to the prepared tin and carefully smooth. Bake the sponge for 7-10 minutes, until golden brown and springy. Turn out on to another layer of greaseproof, sprinkled with sugar. 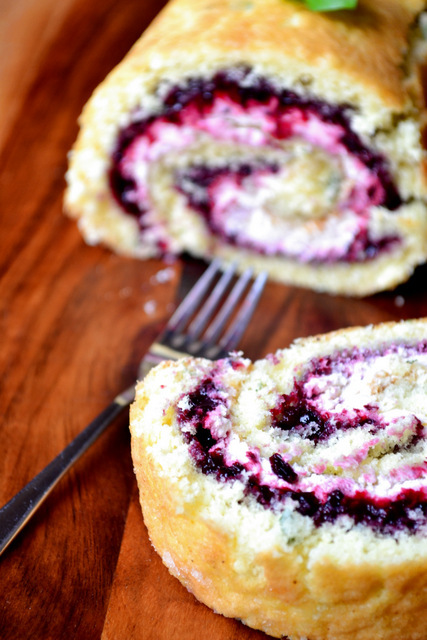 Unroll and spread the jam across the cake, leaving a border of roughly 2cm. Pour the cream and icing sugar into a small mixing bowl and whip. Using a palette knife apply the cream to the top of the jam evenly. Using the paper to help, roll up the sponge, being careful not to squeeze so tightly as to remove too much of the filling. 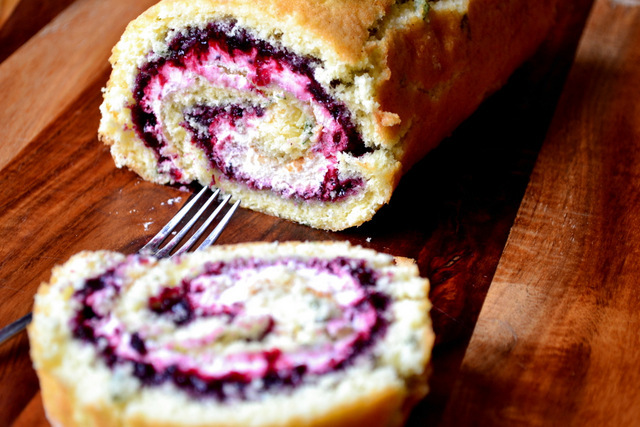 Slice off the unfilled portion of the Swiss roll from either end of the cake and serve. This cake should keep in the fridge – covered – for several days. Cost: Containing no fat – butter – the sponge of a Swiss roll is considerably cheaper to produce than even a Victoria sponge. The jam used in this recipe also set us back very little, it being made of hand-picked blackberries and home grown basil. But even if you decide to use a jam from the supermarket, this wonderful Blackberry and Basil Swiss Roll shouldn’t set you back more than £2.10. This sounds delicious! I’m about to run to the kitchen and make it but it will have to be raspberry since that is what I have on hand. I hope the basil will work with that. Oh, I’m sure it will! Sounds delicious – enjoy. I love Swiss Roll, and that filling sounds perfect. Lovely. Thank you, the filling was genuinely superb! I love swiss roll (which bizarrely in Spain is called a “gypsy’s arm”!) and somehow feel that they were not quite so naughty as they are fat free (I don’t think about the sugar ;). Love the filling you used, delicious and different. That’s an odd name… Any idea why? They are naughty, but the lack of butter does help! I love swiss rolls – particularly when cream is involved. I often use fresh fruit instead of the jam, and occasionally replace a big spoonful of the flour with cocoa powder for a chocolatey version. Chocolate with raspberries, orange zest, and cream is quite wonderful, although I’m keen to try your sophisticated blackberry and basil incarnation. I’ve always used a clean tea towel instead of greaseproof paper to roll the cake – a lot easier to control, and the fabric breathes better. I’ll be doing a recipe for Yule Log soon and I can’t wait! I’ve not had a problem with the greaseproof I have to say, but perhaps I’ll give your method a shot! I’ve been seeing more & more basil in desserts recently, this sounds absolutely amazing. Thank you; it adds a little layer of fragrance that’s really pleasant. 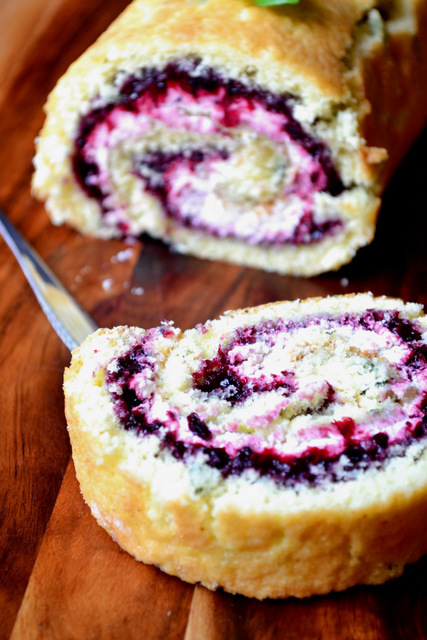 This swiss roll sounds so lovely… I love the combination of berries + herbs. Too bad blackberry season has just ended for me, I have it bookmarked for next year. Funny, my sister just left for us a box of blackberries on the windowsill, right next to the basil plant… is that a sign? Beautiful roll!